Disney is no stranger to hit movies — in fact most of the studios releases are expected to be box-office successes, and Wreck-it Ralph did not disappoint. Now the blockbuster flick attempts to become a cross-over hit as a game. The game brings five fun sub-games within, inspired by some of the movie’s most memorable scenes. 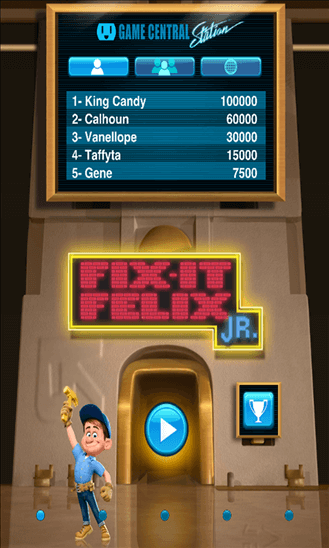 There’s Fix-It Felix Jr., where you fix what Ralph has wrecked; Hero’s Duty, which lets you suit up as Sergeant Calhoun and blast cy-bugs; Sweet Climber, where fizzy jet packs help get you toward the top; Turbo Time, a fast race for the gold; and Flight Command, a flight simulator that strengthens all of your piloting skills. Wreck-it Ralph for Windows Phone is not free, but $0.99 is rather small fee to pay for more than 100 levels of entertainment, involving wrecking, fixing, blasting and soaring. Good luck.